The Honda CR-V once ruled the premium SUV segment, it was a time when fuel prices were a bit on the lower side. Not getting a diesel engine had a negative impact on the sales of the car, which is now barely making any sales. Honda now is setting eyes again on the crown by launching the new, fifth-generation CR-V in the market, which gets a new diesel engine as well. What else is new? The car is now a bit longer than the car it is replacing, which has translated into 50 mm of additional knee room in the second row and the car also gets a third row of seats, which makes the new CR-V a seven-seater. Here is our review of the new SUV from the Japanese manufacturer. The front of the car gets a revised front end with an interplay of three colours including the body paint, piano black and some satin grey highlights. Tasteful use of chrome all across the body is something we really like, even the headlights get some chrome treatment which all comes together in a very beautiful manner, nothing is too over the top. The side profile of the car is highlighted by 18-inch dual colour wheels along with black cladding all around the lower side. The rear gets a spoiler behind the shark-fin antenna, a horizontal chrome applique connects the new design tail lamps, the satin grey highlight is also present at the rear below the rear bumper. 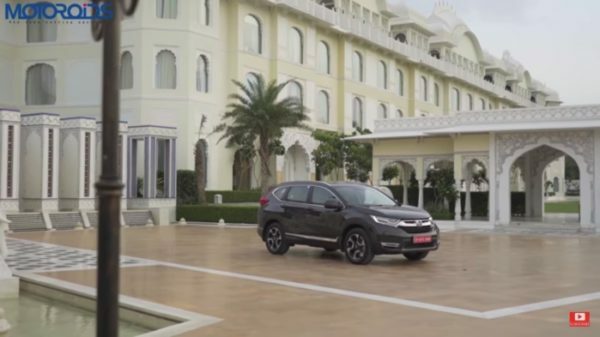 Overall the CR-V is a very premium looking SUV which somehow manages to hide its size in a good manner. 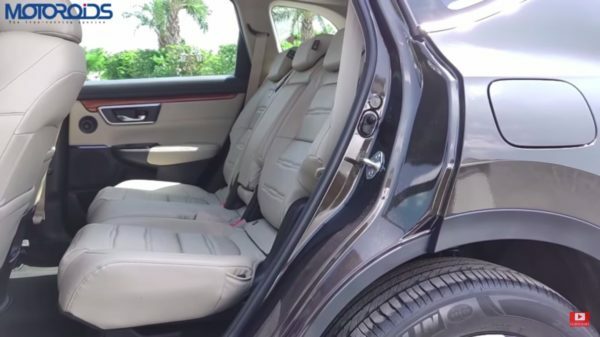 As one would expect from a car of this segment, the interior gets top-notch materials in terms of quality, there are no hard plastics seen in the cabin, all materials used are soft to touch. The seats are made up of a combination of leather and leatherette which look plush and do a great job of holding you in comfort. The driver seat can be electrically adjusted and also gets lumbar support. The second row of seats offer great space and can manage to accommodate three adults thanks to the non-existing transmission tunnel bump. The second-row seats can be moved forward and reclined for a good seating position and also to give some more space to the third-row passengers. The third row is accessed by tumbling down the middle row seats, the entry point is low but the lack of headroom could make it a bit cumbersome for tall people to get in. Once inside, with the middle row seats all the way forward and backrest kept straight, one may find enough space for a short journey. The third-row backrest can also be reclined for added comfort. The fifth-gen CR-V comes loaded with a lot of tech features, the smart key can be used to open up all the windows and the sunroof. Inside, a 7-inch touchscreen infotainment system welcomes you, the screen is Android Auto and Apple CarPlay enabled. Connected to a six-speaker system, the CR-V also gets a speed warning alert which is activated once you cross a speed of 80 kilometres an hour. The instrument console is also a digital unit, what Honda calls the Driver Information Interphase, which gives you a tonne of information and some customisation options as well. 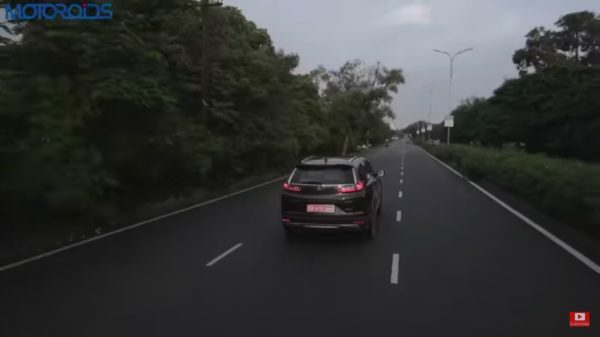 The SUV also gets a blind spot camera, mounted below the left rear view mirror which makes the process of changing lanes much simpler. The rearview camera offers three viewing angles for added comfort while reversing the car in and out of tight spaces. The car also offers 6 Airbags, ABS with EBD, 4 disc brakes, traction control with a stability programme and ISOFIX child seats support. The CR-V gets 2 engine options with separate transmission options. The much-awaited oil burner is a 1.6-litre diesel unit makes 120 bhp and 300 Nm of torque. Mated to a beautiful 9-speed automatic transmission, the engine loves to rev and invites you to drive harder. 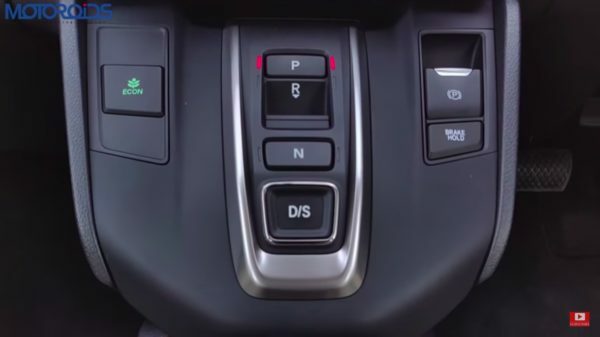 The diesel unit also gets gear selector buttons instead of a normal gear lever, which adds to your visual experience. The petrol engine, a 2-litre unit which churns out 154 hp and 189 Nm of torque comes mated to a CVT automatic gearbox. The petrol engine offers decent driver engagement but the diesel unit is what we would prefer to take out. The CR-V comes with an option of two-wheel or four-wheel drive. We drove the four-wheel drive variants, which sends power to the front wheels under normal conditions, however when the car senses traction getting low, it can send up to forty percent of its power to the rear wheels which will come handy while driving through a slushy trail. The steering, an electric assist unit, is easy to use but a bit too light for our liking, it weighs up nicely at higher speeds. the suspension set up is soft enough to handle bad roads while providing stability while taking corners. In our opinion, the CR-V is the best handling SUV in its segment. 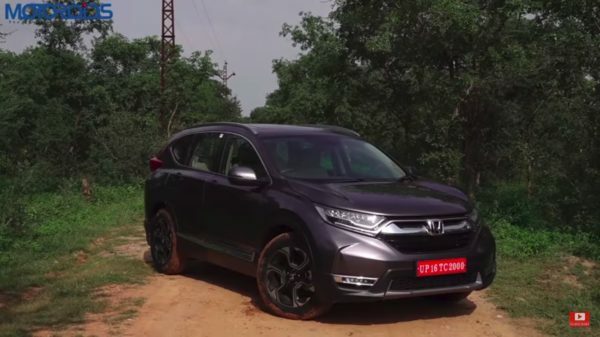 The prices for the CR-V are not out yet which makes it difficult for us to give a verdict on, it offers very nice equipment, a generous amount of space and safety tech. It is a very good SUV which stands out with its better on-road performance compared to the like of the Fortuner and Endeavour, if priced right, the CR-V should definitely be back on our roads and claim its throne for the best selling premium SUV in the market. Do watch our detailed review video down below.